I wanted pictures of the Atticus team with sweatshirts and flag from Sea Shepherd before I revealed them as our December 1% For Good donation, but today’s photographs and reports coming out of the Southern Ocean Whale Sanctuary have forced my hand. While Sea Shepherd’s fulfillment for their online store may be very slow – their boats are much faster at intercepting and driving out the Japanese whaling fleet from Antarctic whaling grounds. Sea Shepherd captain, Canadian Paul Watson has been combating the Japanese whaling fleet for years and has been featured on the show, Whale Wars. 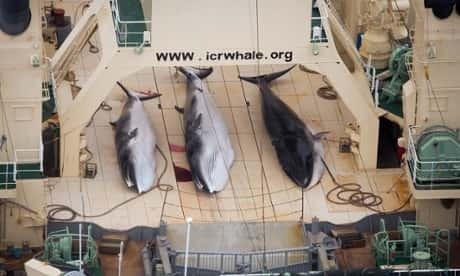 The Japanese fleet exploits a loophole in International Law to “harvest” whales for scientific purposes – supplying whale meat to the Japanese consumer market. According to yesterday’s statement by Sea Shepherd – they have driven the whaling fleet out of the southern whaling grounds. Watson is facing numerous legal concerns – and while the organization may take heat from some within the legal community for their actions – we are very happy to offer a small piece of financial support to Sea Shepherd’s efforts to publicize and stop the slaughter of whales. Update: Recently, the attorney who represents Sea Shepherd did an interview on KEXP to discuss his work with the organization and the recent U.N. court ruling to end Japan’s whale huntington. You can see it here on his blog article, ‘Why I Represent Sea Shepherd‘.